With very attractive flowers in summer, Galtonia are known as the summer hyacinth. Only two Galtonia species are widely available for sale, although a number of species can be found at specialist nurseries. 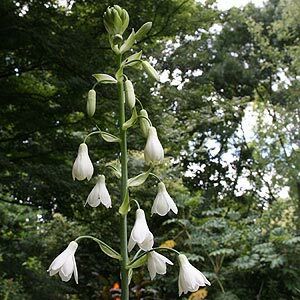 A fragrant bulb that are native to South Africa, Galtonia are a summer flowering bulb. The species include desirable varieties such as : Galtonia candicans, princeps, moonbeam and viridiflora. All species are fragrant and all well in a sunny position. Try growing these bulbs in a large pot or container for an outstanding display. The popular, G. viridiflora (Green Summer Hyacinth) and G. candicans (Summer Hyacinth) both like a sunny position a well drained soil enriched with compost and room to spread, Galtonia resent being moved. Well drained soil in good sun. Choose a position that does not receive heavy frosts. Maintain moisture through spring and summer until the foliage begins to die back. Hold back on water after this. Use a little general purpose slow release fertiliser in early spring, of simply top dress in late winter with some well rotted compost and aged cow manure. Fertilise again after flowering while the foliage is still green. Leave the bulbs undisturbed for 4 – 5 years and they will flower well. You will need to divide them after 5 years to prevent overcrowding, earlier if they stop flowering. As a cut flower G. candicans make a spectacular display, 1 to 1 & 1/2 metre tall with flowers that will last up to week. Galtonia princeps is a shorter growing variety to 30cm high. The best time to Buy and plant Galtonia Bulbs is from Autumn to Winter.